At the end of the 18th century the Netherlands were occupied by the French revolutionary armies of Napoleon Bonaparte. As a result new rules and laws were introduced. One of these new rules was the obligation for municipal authorities to keep records of its population at the registry office. The main reasons for this were to keep track of all young men that could be conscripted for military service, and to be able to collect taxes more efficiently. According to these new rules heads of families had to register a common family name for all family members in their household. Furthermore, from that time on the family name of a father was passed on to his children. Before the introduction of this register, the surnames of people were usually derived from the first name of their fathers (called a patronimyc). For example, the children of Jan Stevensen all had the surname Jansen. 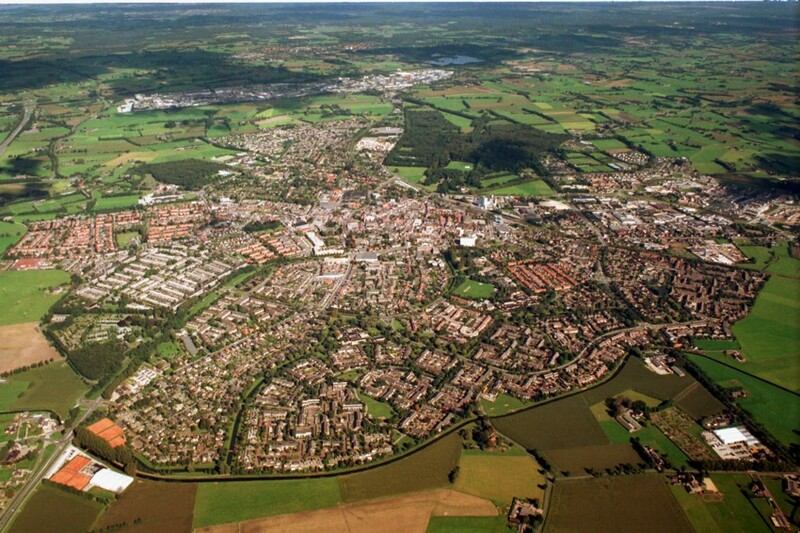 In those days, a man called Steven Jansen lived on a farm called 'De Groote Kleut' (meaning 'the large Kleut'), close to a small town called Barneveld in the Netherlands. 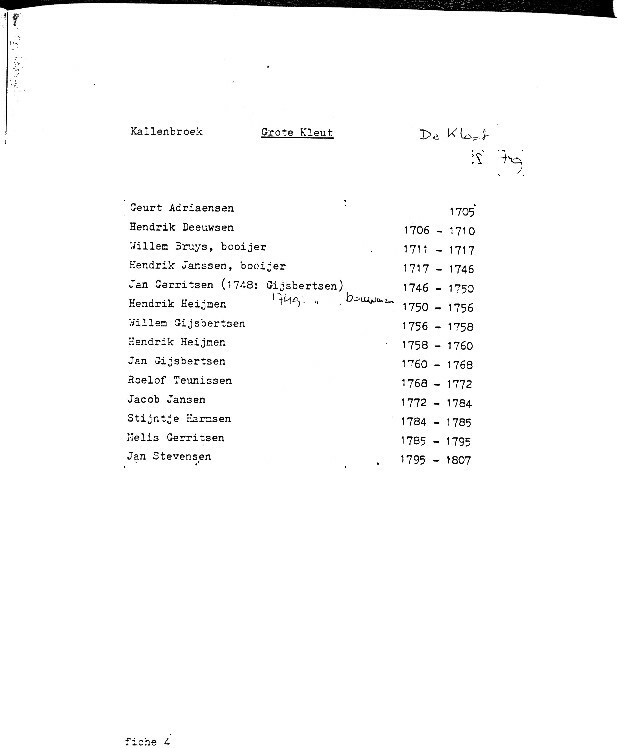 Before him, his father (Jan Stevensen) lived on the same farm from 1795 to 1807 (see the list of inhabitants of 'De Groote Kleut', generated by the municipal archive of Barneveld). On October 9th 1812 Steven Jansen registered 'Van de Kleut' (literally meaning 'from the Kleut') as his family name, thus referring to the name of the farm he lived on. The farmhouse still exists today, and can be found at the Kleuterweg ('Kleut road') in Barneveld. Its name also can be found on maps of the Barneveld area, dating from the years 1866 and 1906 (see below). 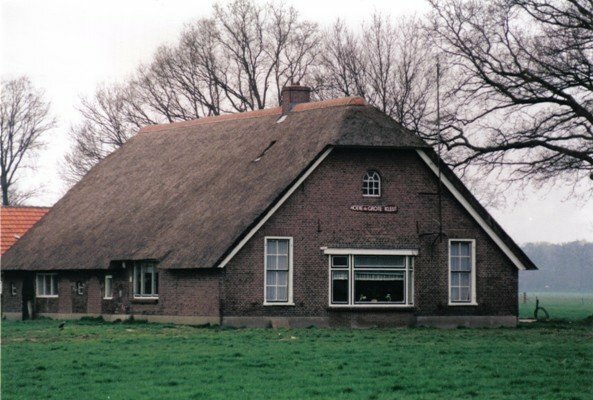 Next to 'De Groote Kleut' there was another farmhouse, called 'De Kleine Kleut' (meaning 'the small Kleut'). If you have installed Google Earth onto your computer, you should be able to take a look at the farmhouse by clicking this link. Maps of the Barneveld area (dating from 1866, 1906 and Google (2006)). The map from 1906 can also be viewed digitally on the (Dutch!) website of the province Gelderland (click here, select 'Zoek Locatie' and fill in 'Barneveld' (Plaats) and 'Kleuterweg' (Straat) ). The farm did not remain in the possession of the family for a very long time. In October 1830 the farm was sold to Coenraad Jan baron van Zuijlen van Nievelt by the widow and children of Steven Jansen van de Kleut. After having established the origin of the name 'Van de Kleut', the question remains what a 'Kleut' is. The word 'Kleut' has no meaning in todays Dutch language. According to a local newspaper called the 'Barneveldse Krant', the name 'Kleut' could refer to a convent court that was located in the vicinity in earlier days. The same article mentions that tiles on the kitchen wall of the farmhouse display the text: "De Bouwman wacht van 's Heeren hand, veel milden zegen op het land" (meaning "The farmer awaits from the Lords hand, much generous blessing on the land"). Another suggestion for the meaning of the word 'Kleut' comes from the grandfather of Gerrit van de Kleut. In the old days there were many farmers in the Barneveld area that were keeping sheep in the heath fields. To keep the sheep rounded up the farmers carried special shovels with a handle that reached precisely to the ground. They used this special shovel to scoop out a clod of ground to throw to the sheep that were wandering of. The Dutch word for 'clod' is 'kluit', which sounds a bit like 'Kleut'. According to Gerrit's grandfather it could have been that our ancestor was very skilful in making and throwing the clods. 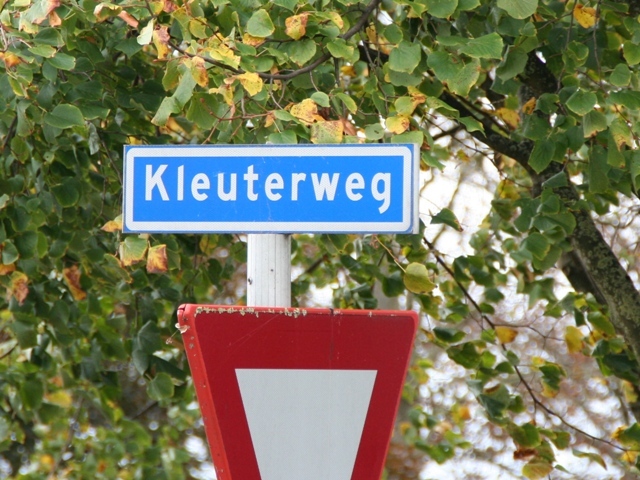 A third suggestion for the meaning of 'Kleut' comes from Marcel Vervloet, a Belgian with a website on the origin of Dutch family names. On his website our name is mentioned in a list with many other family names (e.g. Cloet (de), Cloodts, Kloote, Kleuts, Cloet, Kluit(s), Van de(n) Cloodt), each of which is thought to refer to the ancient Dutch word 'cloot'. The word 'cloot' can be translated as 'clod', 'clump', 'clay', 'loam' or 'peat'. 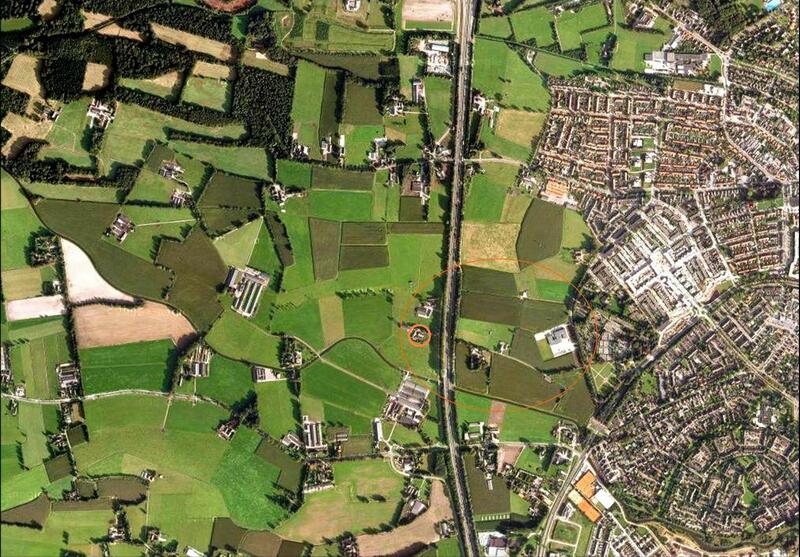 Marcel suggests that in our situation 'Kleut' could refer to the soil type of the farmland. Possibly the soil at 'De Groote Kleut' and 'De Kleine Kleut' differed from the surrouding farmlands. The additions 'large' and 'small' could refer to the size of the farmhouses, or to the size of the farms, or even to the size of its inhabitants. Alternative ideas and explanations are always welcome ! And what about 'Van der Kleut' or 'Van der Kluit' ? On several occasions in history the name 'Van de Kleut' was spelled wrongly in official documents, mostly as 'Van der Kleut'. Usually these mistakes remained without consequences, since they were incidents and were corrected afterwards. However, on some occasions a slip of the pen was not corrected, e.g., when Woutertje van de Kleut reported the births of her children at the register of population (1854-1862). The fathers of these children were not known, therefore the children received the family name of their mother, which was written down in three different ways (Van de Kleut, Van der Kleut, and Van der Kluit). Presumably Woutertje could not read or write, so she could not correct the writing mistakes made by the civil servants of the register of population. Next to this, she might have mixed up the last names of her parents, i.e., 'Van de Kleut' and 'Van de Kuit'. Considering the fact that she gave birth to five children from unknown fathers, and since she lived no longer in the direct vicinity of Barneveld, she probably also had little contact with her family who could have helped her with the spelling of her family name. Woutertje died in 1862 (probably) at age 31. At that moment her sons were only 8 years old (Pieter Christiaan van der Kluit), 4 years old (Jan van der Kleut), and almost 1 month old (Hendrik van der Kluit). Hendrik also died 4 months later. Pieter Christiaan and Jan started families of their own, both keeping the family name they received at their birth, i.e., 'Van der Kluit' and 'Van der Kleut', respectively. A more recent case of misspelling the family name could have taken place between 1900 and 1932. There probably is a missing son/father between Johan George van de Kleut and Johan George van der Kleut. In between these generations the family name seems to have changed, although it also could be that this was an incident. Unfortunately there is not more info available.